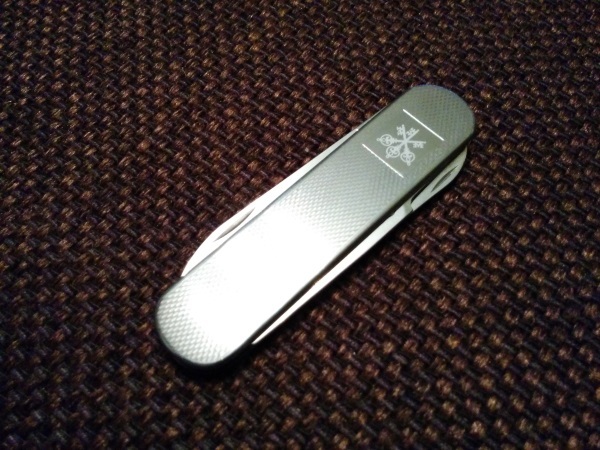 This is a Victorinox Windsor with the UBS logo. The three keys were also used for the logo of the SBC (Swiss Bank Corporation). The merger forming UBS took place in 1998 and this knife may or may not be older than that. A different variation of this knife exists with 1872 added to the logo which makes that one an SBC knife. So I’ll call mine a UBS Windsor. It’s a terrible photo, but a pretty nice little knife. I usually don’t like SAKs with company logos, but for this one I can make an exception (hey, that’s the millionth time I make such an exception :D ).